Why not add our vertical sun protection Fixscreen® blinds to your Algarve or Camargue to further extend the benefits of your choosen canopy. By incorporting Fixscreen blinds your outdoor space is now protected against the sun, wind and rain, and also gives you extra privacy. Integrated Fixscreens® are available in some 50 colours and enable you to customise your canopy and to create the ambiance of your choice. Thanks to an ingenious zip system, the Fixscreen® is windproof in any position. Furthermore, it also protects you against insects when closed. The zoom of the fabric has a special symmetrical zip. In this way, the fabric is fixated in the side channels. RENSON® provides a 7 year warranty on its Fixscreen® technology*. * zip remains in side channel. NEW for 2019! Garden House Design are delighted to also announce that we can now offer Fixscreen Blinds for your windows! Simply call us for more details. Don't want to loose the view of your garden, then perhaps adding a clear crystal window into your fixscreen will be just the answer! The transparent type of fabric is made from PVC and is designed into the fibreglass fixscreen fabric using high frequency welding. 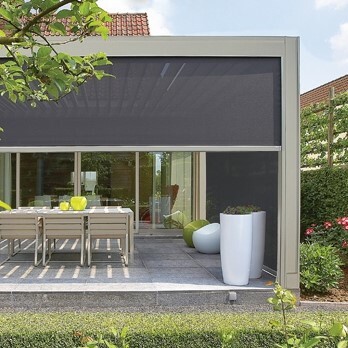 Algarve® Canopies can combine with the Fixscreen 100Evo Slim or the Fixscreen 150Evo products by mounting the box of the blind on the top and side frame profiles of the Algarve, meaning that it ties in perfectly with the basic construction. The aluminium parts will be produced in exactly the same RAL colour as your main structure. The Fixscreen 100Evo Slim can be used on sides up to 4000mm, with the Fixscreen 150Evo on sides over 4000mm. Camargue® Canopies use intergrated technology whereby the blind profiles fitted directly into the leg profiles of the Camargue along with the box for the blind and the bottom bar developed that when the screen is raised it is aesthically hidden away in the roof profile.